There’s this song in the opening of last night’s ARASHI NI SHIYAGARE that earwormed its way to me. It was covered by comedian Himura (of Bananaman, thanks @yuui1010 for clearing this up, not familiar with Japanese comedians even if lotsa of them guest on Arashi shows lol) who was the guest and the title is “Get Wild!” Thanks to Mr Google, I found out that the original artist was TM Network, a pop rock band apparently famous in the 1980s. Here’s Himura singing the song while Arashi watched with a look of both amusement and dismay. Back to the Shiyagare episode, it was fun with the boys being made to do all sorts of facial contortions that Himura is famous for. They were game for it of course because these boys understand that part of being an idol their job is to entertain, even if it means doing ugly faces on TV. And there’s going to be a part two next week and based on the teaser, Himura covers “Love So Sweet” while Arashi members serve as… back-up dancers? I hope they cover “Get Wild!” too but I don’t see how since it’s a cover of a cover. P.S. Oh and Nino, your special nickname for Matsujun is no longer exclusive. Let’s get J! And et’s get wild and get some GREEN orange juice? ← JE politics: Team I or Team J? Well, why? Coz those two really have mecha mecha comfortable relationship with them. Esp with Nino n Aiba-chan. I think I remember, Himura or Shitara, once said in (one of) their shows, that he would really like to have Nino as his son XDD I believe it’s Shitara. Aha. 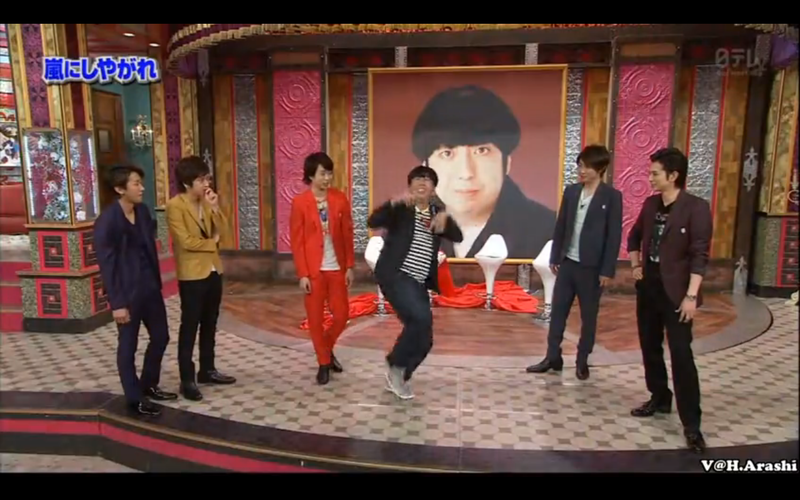 If his fave member is Nino, that was obvious during the show lol you gotta watch it to know why. Fun episode!